Whenever I stand stirring porridge I think of the constellation of Orion, that homely, saucepan-shaped arrangement of stars whose base lies along an imaginary line known as the celestial equator. As children in the Southern Hemisphere, peering up into the night sky, we recognised it as The Saucepan, or the Porridge Pot, never dreaming that on the other side of the world the same stars appeared upside down and people interpreted them as a giant with a sword and belt. This Monday morning it is porridge with a spoonful of honey and a scattering of walnuts and flaked almonds, a dish as warming and good as it is simple to make. 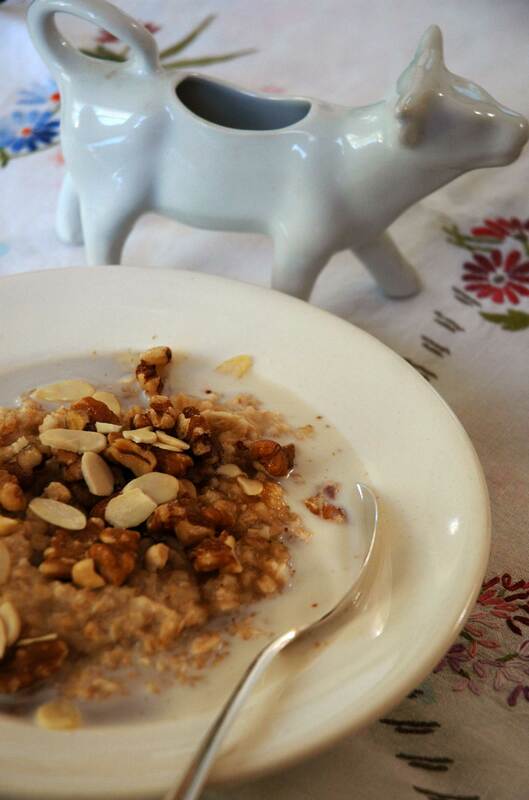 Oat porridge is so old that it has been found in the stomachs of 5,000 year old Neolithic bog bodies in Central Europe and Scandinavia. As with drinking tea, eating a bowl of porridge on a winter’s morning has a timeless feel. To cook the oats I always use water. They produce their own milkiness as they begin to break down. Once I turn the mixture into a bowl I add a drop of skimmed milk. Years ago I would always add salt to the porridge pot, but since I rarely add salt to anything these days, the porridge now does without. Honey might have been made specifically to sweeten this earthy breakfast. And the nuts, although not essential, add a delightful crunch. You can lightly toast the walnuts and flaked almonds on an oven tray if you have the time to hover over them, because left alone they have a tendency to burn. It’s odd, the way we can look at a pattern of stars and see different shapes. Even when I lived in the Northern Hemisphere I had trouble envisaging that giant. To me, Orion was still a saucepan, albeit one tipped upside down, spilling its porridge. Maori people look at the same stars and see a bird feeding on fruit. Orion is the right way up again now, a sign that I am in the right place. The porridge pot is in its heaven: all is right with the world. Wherever you are reading this, enjoy your breakfast. 23 Jul	This entry was published on July 23, 2012 at 7:32 am. It’s filed under Uncategorized and tagged beautiful breakfasts, carol lefevre, flaked almonds, food writing, honey, orion, porridge, porridge pot, the saucepan, walnuts, winter. Bookmark the permalink. Follow any comments here with the RSS feed for this post.